Meet Mary Lou Bartlett, a long-time crafter who has held several offices in the Erie Guild of Craftsmen. 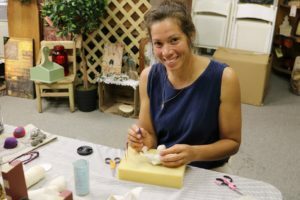 Mary Lou has been crafting for almost 30 years. She started out creating door wreaths and brooms. Later, she started doing ceramics, taking ribbons for several pieces at ceramic competitions. 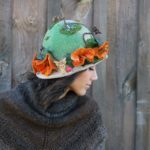 In 2011, Mary Lou discovered her two true passions – sewing and jewelry making. 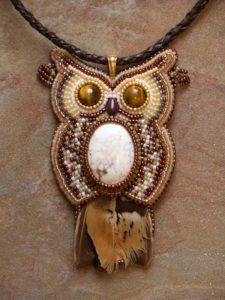 She started making angel jewelry, as well as sweatshirts, jackets, scarves, and hats. To this day she still loves to create jackets. Mary Lou has been a member of the Erie Guild of Craftsmen for almost 25 years. She is inspired by her 3 children, 8 grandchildren, and 7 great grandchildren, and her water garden with fish and flowers. 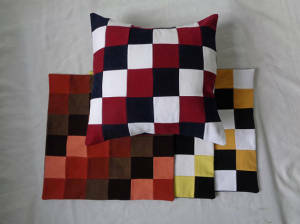 Here is Lisa with her beautiful patchwork creations! 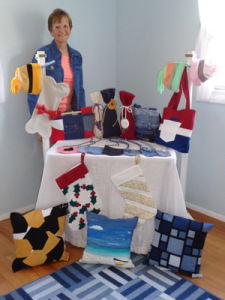 Meet Lisa Priestap, an Erie, PA crafter who upcycles old jeans into pillow covers and tote bags in beautiful geometric patterns! Lisa started creating these items about three years ago. 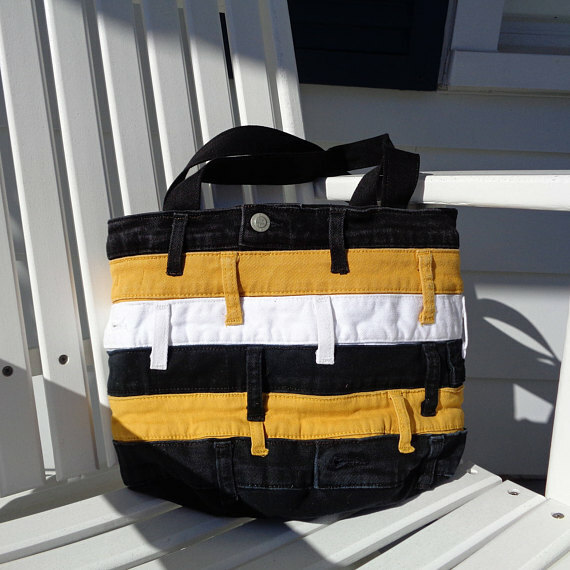 Her friend was getting rid of their old boat sail, and Lisa gave it new life by using it to create tote bags. They sold like crazy! When she ran out of material, she decided to switch to using jeans. Used jeans are never in short supply, so she can sew to her heart’s content (while also doing her part to help reduce the landfills!). Lisa’s current favorite thing to make is bags from old jean waistbands! 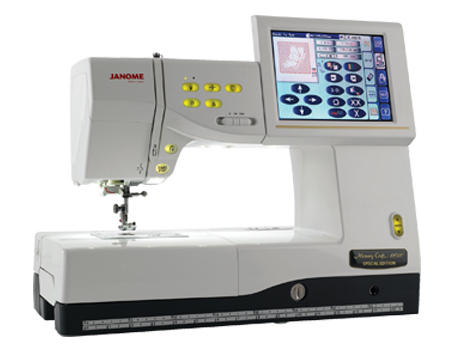 Lisa has always loved sewing – it’s in her blood. Her grandparents were a tailor and a seamstress, and they passed their love of sewing onto her. She has a hard time choosing her favorite thing to make – because it changes all the time. 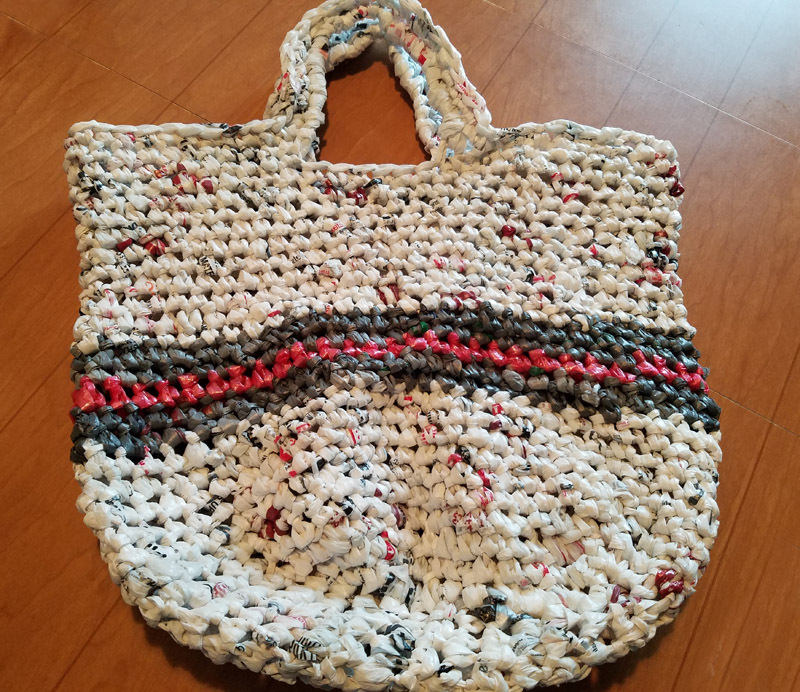 She loves doing pillow covers in different designs, pocket purses (made from old jean pockets), and her current favorite is bags made from old jean waistbands. Lisa sells both in person and online. 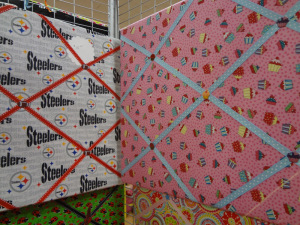 In person, she sells at craft shows, where her most popular products are bags and purses. Online, on her Etsy shop, she sells mostly pillow covers. When looking for new ideas, Lisa likes to browse the internet and see what’s new and in-style. Then, she puts her own twist on it by changing the colors or pattern. Her biggest challenge with creating new items is that the colors depend on the used jeans that she can find. Lisa loves to find uniquely colored denim so she can create beautiful patchwork patterns like these ones. 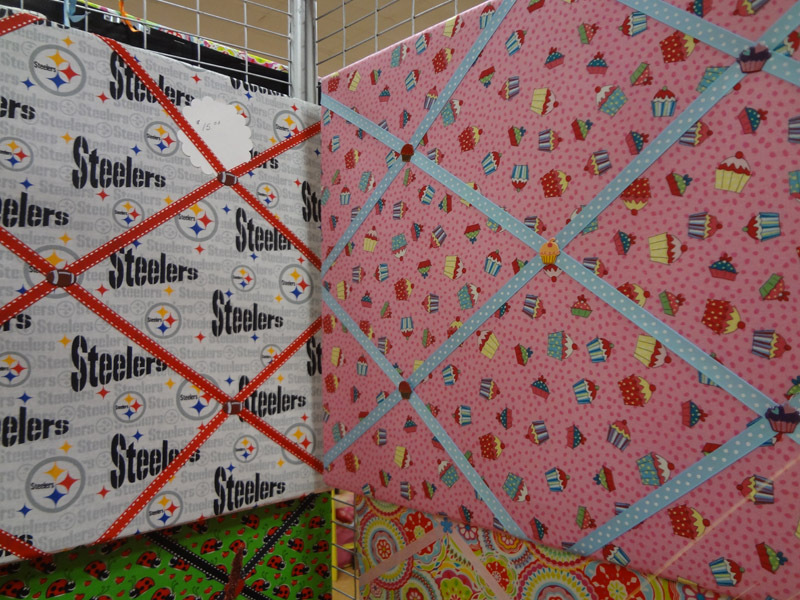 She has some exciting new products coming up, including hand-painted items like wine bags and Christmas stockings! Personally, I’m excited for the Erie lighthouse-themed wine bags which she is planning to have at her next show! You can purchase her beautiful items at her Etsy shop (DenimDesignsbyLisa), or in-person at the Erie Guild of Craftsmen Fall Show. Meet Jennifer Phillips, certified Master Spinner and sheep lover! 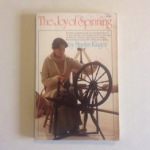 Jennifer became interested in spinning yarn when she read the book The Joy of Spinning by Marilyn Kluger. After reading the book, she knew she wanted to learn the craft some day. A few years later, in 2007, her husband wanted to get her interested in the farm. This became the perfect opportunity for Jennifer to start spinning. 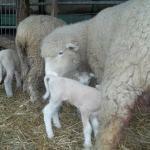 She told her husband she wanted sheep, and he brought two old ewes home to her for Mother’s Day. She fell in love with her sheep. When one passed away, she sobbed as she hand-cut the wool off. Seeing how crushed she was, her husband told her he’d do anything to stop her from crying. Her request, of course, was more ewes. Eventually, she had so many different breeds that her husband told her to choose one. She chose Dorsets, because they are extremely low-maintenance. Shortly after birth, their babies are dry, clean, and nursing with no help whatsoever. Plus, Jennifer loves the smell of their wool. Later, after trying out additional fibers, she discovered the Leicester breed. 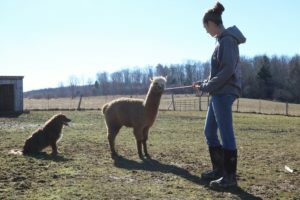 This rare breed is now endangered, so Jennifer decided to adopt and raise them to help preserve the breed. 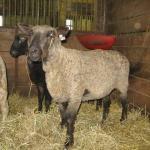 She also likes to cross-breed her Dorsets and Leicesters. 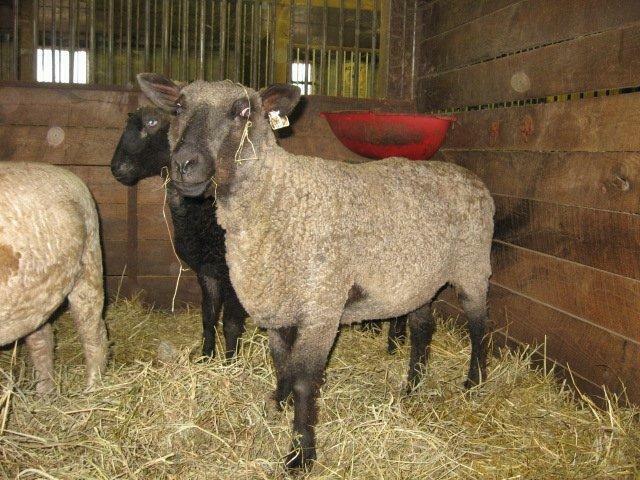 Jennifer also owns Leicester sheep, which are an endangered breed. 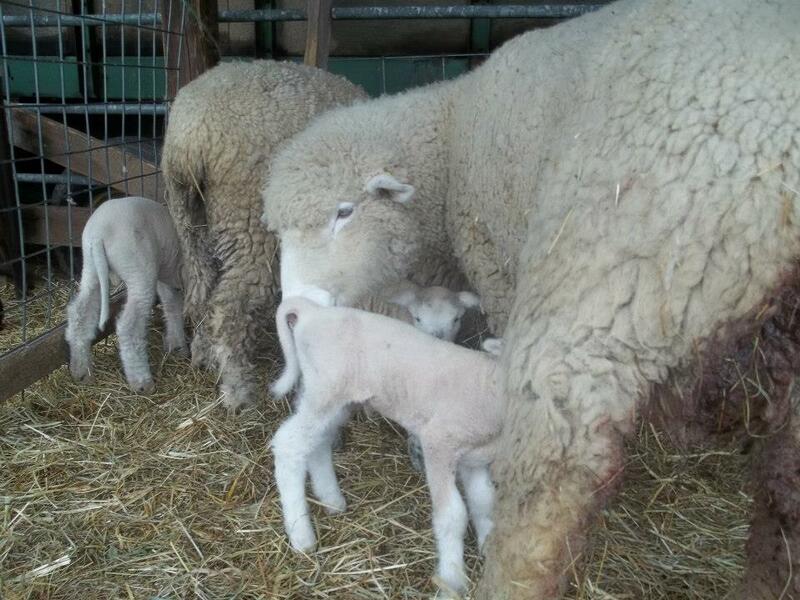 Jennifer currently owns 23 sheep – 15 adults, their seven babies, and one new baby she has recently adopted. Jennifer is a Master Spinner – she cleared her quota for teaching in the summer of 2012, when she taught over 700 students! She did this by teaching at a camp in Pennsylvania, where students attended from all over the world. 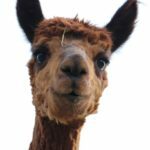 You can connect with Jennifer on Facebook and Instagram, where she often posts photos of her cute lambs and beautiful hand-spun yarn! You can purchase her yarn at local craft shows (including the Guild Fall Show), and at Brown’s Primitive Scentiments in Titusville, PA.
Kathy Alexander, a longtime member of the Guild and seasoned Etsy seller, has been knitting & crocheting since she was ten years old. She got curious after watching her mother knit, decided to try it, and hasn’t looked back since! 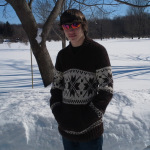 Kathy’s grandson, Matt, models her sweaters for Etsy photos! 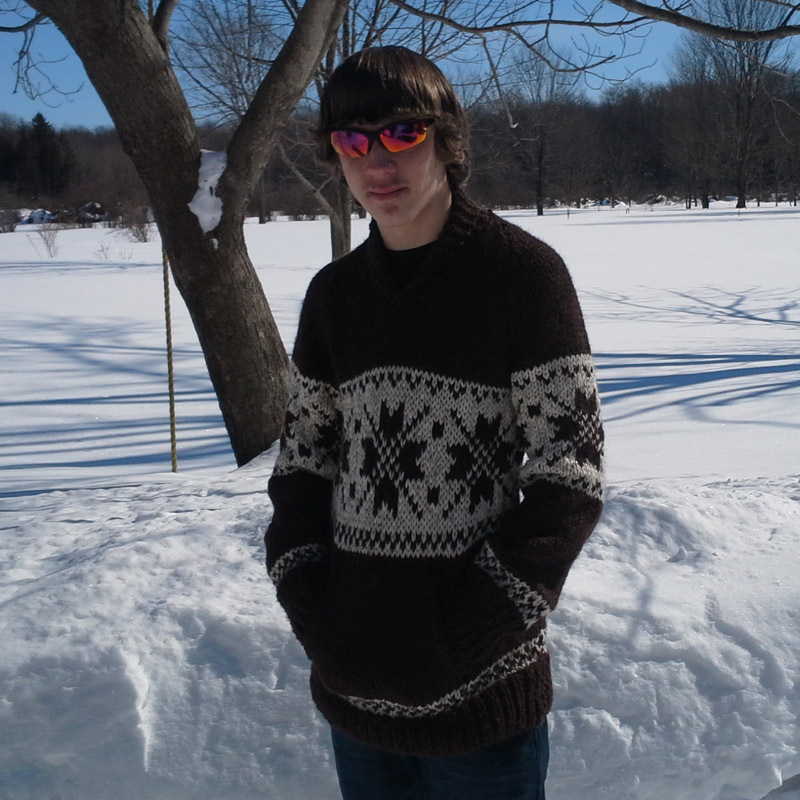 Here he is modeling a Cowichan sweater she knitted. She first started selling her sweaters at work – after seeing the sweaters she had made for her grandkids, her coworkers started placing their own special orders. After that, she started selling her sweaters at craft shows. 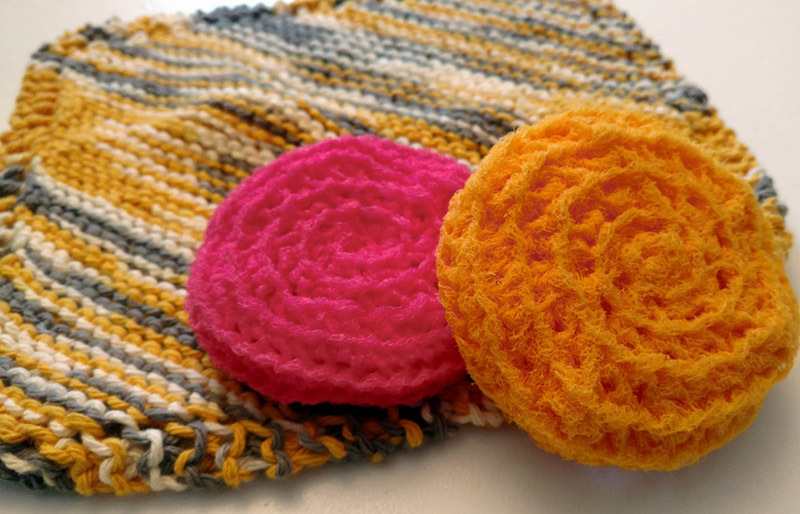 To reach even more customers, she opened up an Etsy shop – back in 2009, in Etsy’s infancy! 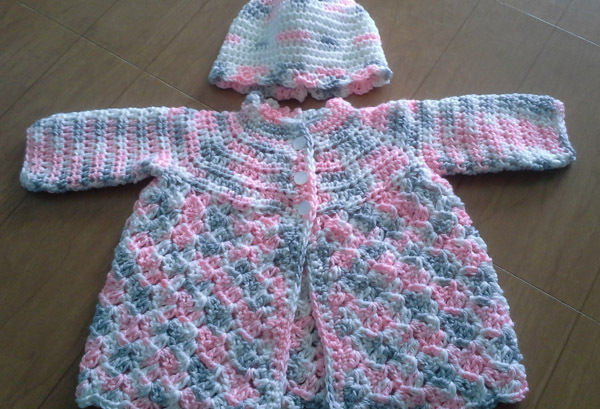 Kathy’s biggest seller is baby sweaters – especially this adorable pink, grey, and white sweater with a matching hat. 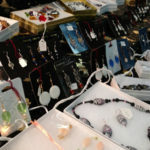 She recommends Etsy over Ebay because Etsy is less expensive and has a more targeted community of users – users that are looking for quality handmade items, rather than trying to score a deal. 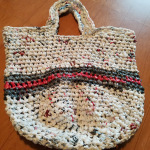 In the summer months, Kathy sells woven bags and rugs. 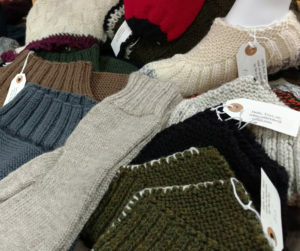 Kathy sells mostly sweaters during her fall shows, but makes tote bags, baby sweaters, and rugs for her summer shows. If you’re interested in seeing more of Kathy’s work, check out her Etsy shop, or visit her booth at the Erie Guild of Craftsmen Fall Show! 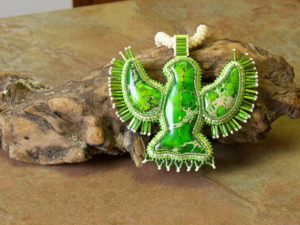 Evelyn Mayer, the current president of the Erie Guild of Craftsmen, has been crafting for all of her adult life. She creates a wide variety of crafts, including fabric bulletin boards, corded bracelets, Seek ‘n Find toys, and dish scrubbies to name a few! The first craft Evelyn learned was sewing. At 15, she took Home Ec class in school where she learned sewing, her creative passion. Her very first sewing project was an apron. Nowadays she sews everything from dresses to stuffed dolls. Her least favorite thing to sew? 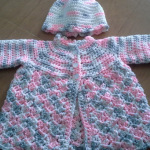 Doll clothes! In addition to sewing, Evelyn also loves to knit and crochet. She makes time to work on her crafts every single day – it’s her “me time”. 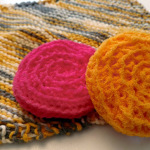 Every night, she works on her dish scrubbies, which are her top-selling item at craft shows (and I can personally attest that these are a great product!). Her favorite thing about crafts is that they bring her closer to people. At shows, she gets to interact directly with her customer base. At home, she uses crafts to create a strong bond with her children and grandchildren. 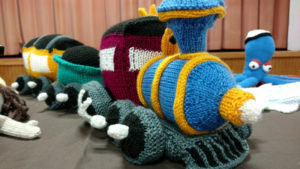 By teaching her kids how to sew and knit, she was able to connect with them on a creative level. Her happiest crafting memory was when she got a fancy new sewing machine – the Janome 1100 Sewing and Embroidery Machine. It is very special to her, because it is the last thing her husband bought her before he passed away. I hope you enjoyed learning about Evelyn! 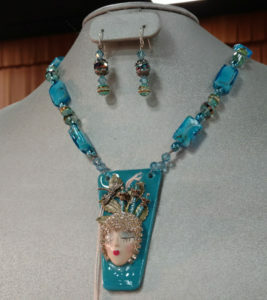 You can find her work at the Erie Guild of Craftsmen Fall Show in October!